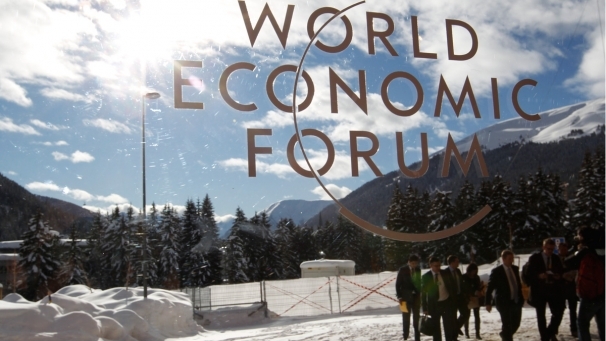 European Leaders have been meeting in Davos this week for the annual World Economic Forum and, inevitably, the Eurozone crisis was the focus of discussion. German Chancellor Angela Merkel has said that transferring more powers to EU institutions rather than increasing the size of the Eurozone’s future bail-out fund is the way to overcome the euro crisis. “We have said right from the start that we want to stand up for the euro, but what we don’t want is a situation where we are forced to promise something that we will not be able to fulfil,” Merkel said in her opening speech on Wednesday. Davos has also highlighted Merkel’s continued position as ‘de facto supremo’ of Europe, as ‘Merkozy’ seems to have fallen apart following the downgrading of France’s credit rating and concerns that Sarkozy may lose the April presidential election. In the words of The Economist’s Charlemagne “the Franco-German tandem has become a unicycle”. Meanwhile, David Cameron urged European leaders to “be bolder’”. Cameron said that it was a “perilous time” for Europe’s economies and “tinkering won’t cut it anymore”. Europe’s problems – notably the debt crisis in Greece and the question marks over European banks – were clear, he said, and “with bold action and real political will we can fix them”. He warned that competitiveness remained Europe’s “Achilles heel”, with the single market incomplete and “unnecessary” measures from Brussels burdening businesses and destroying jobs. He proposed a “checklist” to remedy the situation, including all proposed EU measures tested for their impact on growth; a target to reduce the overall burden of EU regulation; a new proportionality test to prevent barriers to trade in services. EU finance ministers have agreed to a permanent bail-out fund (the ESM) for the Eurozone, access to which will be made conditional on signing a new treaty on fiscal discipline. The ESM, is to be advanced by one year and to come into being on 1 July with current funds set at €500 billion. Key talks between Athens and its private creditors are set to resume, in order to agree a debt write-off that would dramatically reduce Greece’s debt levels. The two parties have so far failed to agree an interest rate on new bonds that would replace existing debts. Reaching an agreement with private creditors is a precondition of any further bailout funds from the European Union, European Central Bank and IMF. They have indicated that €130bn is available if a deal can be struck. They are also insisting that Greece accelerates structural reforms to strengthen its economy before any funds are released. The EU commission has unveiled an EU-wide law on internet privacy. The new law, announced by EU justice commissioner Viviane Reding on Wednesday, gives people the “right to be forgotten” by enabling them to force firms such as Facebook or Amazon to take their personal information off the internet or to delete it from their internal servers unless they can give a compelling reason to say No. EU finance ministers have warned Hungary that it may lose EU funds if it fails to fix its excessive deficit, a problem since 2004. “Hungary cannot face sanctions under the excessive deficit procedure as it is not a member of the euro area. But for beneficiaries of the EU’s cohesion fund, such as Hungary, failure to comply with the Council’s recommendations can lead to the suspension of cohesion fund commitments,” the ministers have said. The warning comes on top of the current proceedings against Hungary as a result of the country’s new constitution. European Union foreign ministers have formally adopted an “unprecedented” oil embargo against Iran over its nuclear programme, banning all new oil contracts with the country. They also agreed a freeze on the assets of Iran’s central bank in the EU. Iran had “failed to restore international confidence in the exclusively peaceful nature of its nuclear programme”, British Prime Minister David Cameron, French President Nicolas Sarkozy and German Chancellor Angela Merkel said in a joint statement. The Guardian is taking part in a new project ‘Europa’ along with five other European newspapers. The project aims to “to build up a more nuanced picture of the EU and explore what Europe does well and what not so well.” The series has already produced a number of interesting pieces on European Leaders and national stereotypes, which you can read here. Finally, police in the Siberian city of Barnaul have asked prosecutors to investigate the legality of a recent protest involving dozens of toys including teddy bears, Lego men and South Park figurines arranged to mimic a protest, complete with signs reading: “I’m for clean elections” and “A thief should sit in jail, not in the Kremlin”. Activists set up the display after authorities repeatedly rejected their request to hold a sanctioned demonstration of the kind held in Moscow to protest disputed parliamentary elections results and Vladimir Putin’s expected return to the presidency in March. This entry was posted in Current Events, News by eutopialaw. Bookmark the permalink.